There are many possibilities for this site - housing, industry, cultural institution, community facility, or any combination thereof. Demolition - without a plan in place - is simply a waste of a building and another opportunity lost for the community. The BRT site is a very interesting location (see image after the jump). The plot to the north (Certified Lumber) is applying for a rezoning to construct housing along the lines of Schaefer Landing or Kedem Winery. 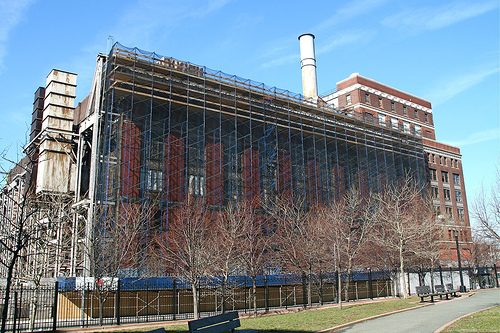 The site to the south is probably destined to become a part of the Brooklyn Navy Yard. To the west is an inlet from the East River/Wallabout Bay, which lies at about the location of the historic Wallabout Creek. To the east (across Kent) is Roberto Clemente Park. This site is really a point of transition, an opportunity to bridge different uses, and provide a connector from the park to the east and the waterfront to the west. The site itself includes a fair amount of open space as it is. As public open space, it could terminate a new waterfront esplanade that would run from south of Division Avenue north to Broadway. None of this requires demolition of the historic building. Without a plan in place, demolition is simply a waste of a building and all of the energy that went into its construction. Short of turning the site over to public open space, there is no use that requires demolition. 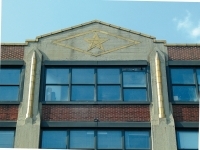 Every year, the Brooklyn Chamber of Commerce sponsors a Building Brooklyn Award for the best architecture of the borough. And every year, Bushwick, Greenpoint and Williamsnburg come up short. Since the nominations are due on Thursday, we'd thought we'd throw out a few of the projects that we think are award worthy (and a few that are clearly not worthy). First, their rules. To be eligible, a project must be completed and have received a CO or TCO in calendar 2008. Now our rules. 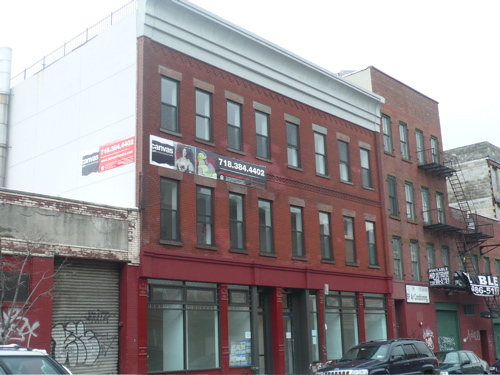 We're looking at projects in North Brooklyn only. The BB categories are a little bit wacky (do we really need two categories for residential buildings under 5 families - that's so 20th-century Brooklyn?). So we've added a few of our own. A luxury loft in Williamsburg that is actually a loft. Not everything here is to the highest preservation standards, but the conversion of this former factory at North 3rd and Wythe has celebrated the historic architecture and the history of the neighborhood. And it looks great. 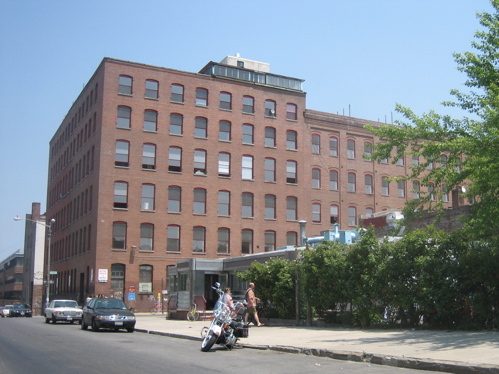 The building itself was constructed for the Hinds & Ketcham lithography company in two parts. The mid-block portion was completed before 1898, the corner piece (directly across from Relish) after 1898. 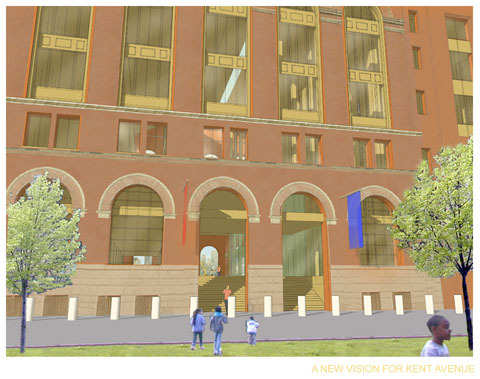 This one was designed to the highest preservation standards - those of the NYC Landmarks Commission - but the results are underwhelming to say the least. None of it rises to the level of the unregulated Mill Building. This project would have passed unnoticed, though, were it not for the cornice, which looks like someone installed a crown molding on the face of a factory. The building is pretty much gone by now, but less than a year ago it was an intact structure. At that time, local blogger INSIJS did an in-depth article on the fate of the building. Everyone, including workers on site, said the building was coming down. When asked it that was true, a Con Ed spokesperson said that they were only doing some "spring cleaning". Spring cleaning that clearly required removing every brick and sending it very far away to be cleaned. Landmarks looked at this property in 2007, but refused to hold a hearing to designate. This despite the fact that that the community had identified the building as a significant resource over a decade ago. The State Historic Preservation Office did determine that the building is (or was) eligible for listing on the National Register of Historic Places. As for the future, Con Ed has no plans for the site. Or at least that's what they say. Have buildings that you think should be included (or excluded) in the BB awards? Email us at wpa [at] โบนัส 100 % กีฬา www.web-actu-blog.com. We mentioned that the Brooklyn Chamber of Commerce's Building Brooklyn award categories are a bit out of date. On way in which they are not keeping up with the times is in not explicitly recognizing green design. We thought that we'd fix that by creating our own Build Brooklyn Green award category, for which we'd nominate the Greenbelt project at 361 Manhattan Avenue. The project is Brooklyn's first LEED-certified residential development, and according to DOB's website received its first TCO in 2008, so it seemed a natural for a Building Brooklyn award. Its also a nice looking building. It seems that the Chamber of Commerce is ahead of us. When we checked their โบนัส 100 % กีฬาwebsite for past winners, we learned that Greenbelt has already won an award in 2008 - for Mixed-Use Development. 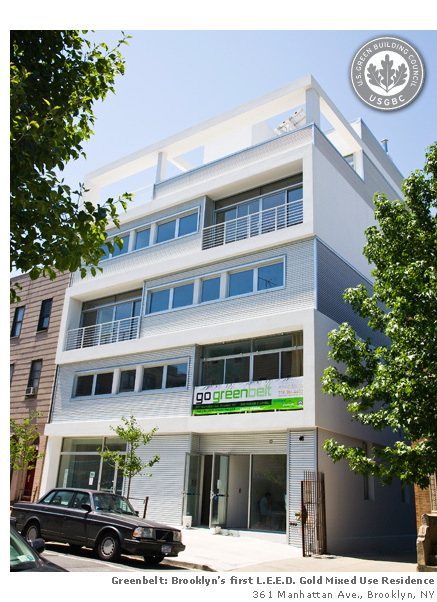 Since they're (still) eligible, and the only game in town in terms of completed LEED-certified developments, we'll nominate Greenbelt for another Build Brooklyn Award, this time in the category of green design. Maybe they can go for the three-peat in 2010.